The circle shows the location of the class G5 subgiant star 109 Piscium (in the constellation Pisces). With a minimum mass of 6.6 times that of Jupiter, the planet is among the most massive known, and perhaps could even be a small brown dwarf. 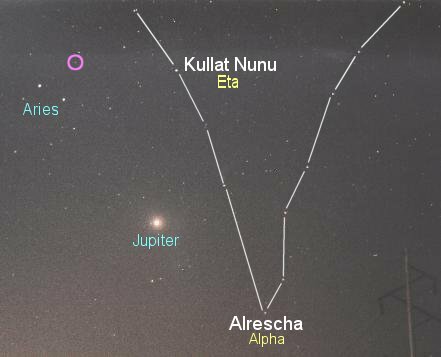 It is also fairly distant from its parent star, orbiting in a relatively circular path at a distance of 2.0 astronomical units (300 million kilometers, or 185 million miles), 30 percent farther than Mars is from the Sun. 109 Piscium, 106 light years away, is a sixth magnitude (6.29) class G5 subdwarf (a star that has either given up hydrogen fusion in its core or is about to do so) with a mass 1.1 times that of the Sun. With a surface temperature of 5600 Kelvin, somewhat cooler than solar, it shines with a luminosity just under triple that of the Sun, its age around 8 billion years, consistent with its subdwarf status. Like many of the other stars that are accompanied by planets, 109 Piscium is somewhat metal rich, its iron content 45 percent greater than solar.